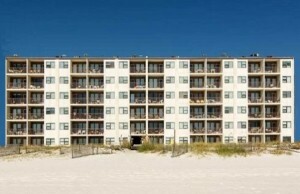 Gulf Shores beachfront condo for sale at Island Shores. This resort property has 2 BR's and is listed at $269k - beautifully decorated and maintained gulf-front residence offers tile flooring, upgraded cabinets and a nice furniture package. Enjoy beautiful direct views of the Gulf of Mexico. Excellent real estate investment - community features an outdoor pool, BBQ grills and a laundry room. The low-density complex is located near the heart of Gulf Shores, easy walking distance to shopping, dining and entertainment. Priced to sell - this could be what you've been looking for!